In September 2011, the Olma Media Group debuted a new book at the Moscow Book Fair. 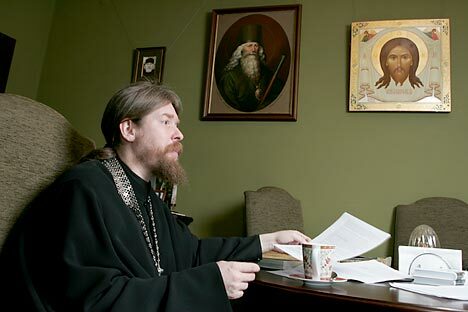 The book was “Unholy Holies” by Archimandrite Tikhon Shevkunov, abbot of the small, yet very active Sretensky Monastery, and it tells miraculous – albeit true – stories from the lives of contemporary Orthodox monks and priests. Olma already bet big on the book, giving it a 60,000 copy first print run – five to ten times higher than a standard first printing. Nevertheless, few saw the real miracle coming – the book has made it on to the list of bestsellers in Moscow bookstores and has remained there for many months; there have already been four editions and the total number of copies exceeds 800,000. Online bookseller Ozon.ru has nominated «Unholy Holies» for the Runet award and it is leading the popular vote for the prestigious «Bolshaya Kniga» (Big Book) Prize. Archimandrite Tikhon’s book has been translated into Serbian, Greek and French, it is being translated into English and talks are underway to have the book translated into German, Italian and French. A poll conducted by the Levada Center in September 2011 showed that 69 percent of respondents called themselves Orthodox, although 47 percent said they never attended church services. Only 3 percent of the respondents go to church on a weekly basis, 7 percent attend services once a month, 11 percent once a year, and 10 percent even less often. Interestingly, polls have also revealed that even atheists prefer to learn about church life from a priest rather than a culture expert or some secular religious scholar. The success of “Unholy Holies” has prompted publishers to take a closer look at writers who tell stories of contemporary church life, including books by author writer, Olesya Nikolaeva. Nikolaeva is a professional poet, writer and lecturer at the Literature Institute, but as the wife of a priest, Vladimir Vigilyansky, she is well aware of the church world. Nikolaeva’s works have been published by the big Russian publishing houses Eksmo and AST, but editors there admit that she has been praised mostly as an author of good romantic prose for women rather than Orthodox prose. One of the most successful Orthodox series is “Nastya and Nikita,” a series for young readers. The project by the Foma publishing house was rolled out three years ago. The series was originally designed as a children’s supplement to a magazine, but the popularity of the stories eventually demanded that the series be spun off. The core of the series consists of thin illustrated paperbacks for children aged five to 11. Two books are available at the beginning of each month, with print runs of 5,000 copies each. The most successful editions are sold within a few months. These books are sold at the publisher’s price – “Nastya and Nikita” is a non-profit project aimed to provide children with affordable high quality literature in addition to the classics that helped educate their parents. The authors of the stories are selected through an Internet contest. The “Nastya and Nikita” books have not been translated into other languages yet, although there have been proposals as the series is well known abroad; foreign readers order books by filling in forms on the website. The books of this series are read even in New Zealand.